Elijah, Elisha, Job, Jacob, Deborah, Isaiah, Jonah, Joshua and Daniel. These people fought and won epic battles, served kings, and endured great hardships for God to come out on the other side transformed through His grace. Through them Maxwell explores timeless lessons we can learn about leadership, ourselves, and our relationship with God. About "Learning From the Giants: Life and Leadership Lessons From the Bible"
:If you could spend a few minutes with the giants of faith in the Old Testament in person, what lessons would they share with you? 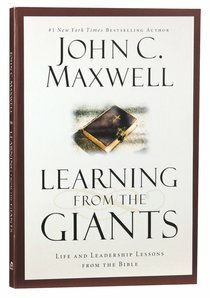 In LEARNING FROM THE GIANTS John C. Maxwell draws on fifty years of studying the Bible to share the stories of Elijah, Elisha, Job, Jacob, Deborah, Isaiah, Jonah, Joshua and Daniel. These people fought and won epic battles, served kings, and endured great hardships for God to come out on the other side transformed through His grace. Through them Maxwell explores timeless lessons we can learn about leadership, ourselves, and our relationship with God.